On This Date: Photo taken 1/4/2011. I've little to say about this one. 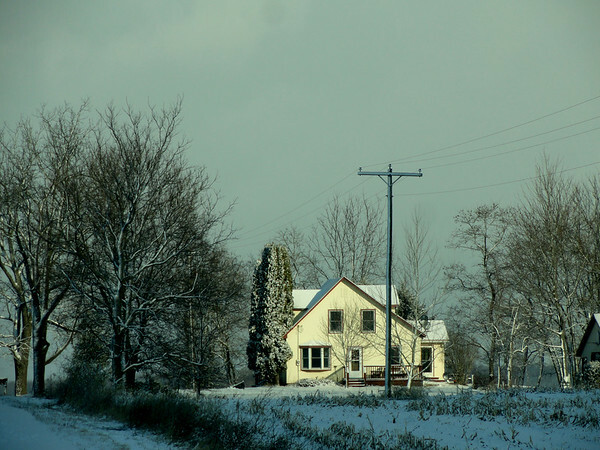 The house was a bright spot in a grey day, so I stopped the car and captured the light. Tell us about the Stars, Joel. The first thing to understand is that my rating system's quick and dirty. I rate the pix as part of my tagging process, usually in a hurry, and rarely "correct" 'em later even if I notice a mistake. The second thing to understand is that the ratings are mine, and used only to help me sort my photographs. That said, they suit my purpose, which is to identify the "best" photographs. One Star means I totally messed it up, and can't tell from the photo what the subject was. An occasional photo in this group could have some decorative value, but most folks would toss these. Two Stars mean there's something wrong with the photo. I moved the camera, or got the focus wrong, or totally blew the framing, or something else went wrong. Some of these could be recovered with work, but these, too, many people would just toss. I also put pix taken to illustrate eBay sales here, for lack of a better place. Scans and photographs of baseball scorecards and other documents also go here, for the same reason. Three Stars is a catch-all. Procedurally, all photographs start here; some get moved to other categories. These are good photographs, but there's nothing special about them. Four Stars means I did everything right--the picture's sharp, well-composed, and otherwise print-worthy. I probably like the photo, too, but that's not a requirement. Five Stars means the photograph's a favorite. Most, but not all, also meet the Four Star requirement of technical excellence. For a 40 photograph outing these days, I usually rate one or two pix at 5, four or five at 4, three at 2, and one at 1; the rest would be 3. My baseball pix are rated on a different, but similar, scale. The main difference is that fewer pix get rated 2, 4, or 5. The very high 2 Star count deserves a comment: About half of these were perhaps-failed equipment experiments; the other half were of a single hawk photographed through a difficult window. I got some good ones of the hawk, too.